Barry Devereux has been re-elected as managing partner of McCann FitzGerald for a second term, beginning next May. 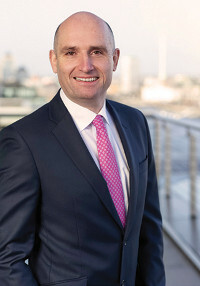 Mr Devereux, who was first elected in 2015, said his priority for the next term would be the continued pursuit of “Progressive Delivery”, the firm’s approach to bringing together legal, business and regulatory knowledge with digital and AI technologies. This approach is designed to develop and deliver a suite of agile and clever solutions that are tailored to the specific needs of its clients. Since the beginning of this year, the firm has launched a series of apps, including a GDPR gap-analysis application, a Credit Reporting Compliance app and a Director Compliance Statement tool. Mr Devereux said: “I am honoured that I have again been chosen by my peers to lead McCann FitzGerald. It is an exciting time, as the market for legal services in Ireland and overseas continues to change at an accelerating pace, affecting our clients, our employees and transforming the entire way in which we do business.